Americans are moving at the lowest rate on record, and recently released Census Bureau data show that a primary reason is that Millennials are moving significantly less than earlier generations of young adults. A spouse. Millennials are less likely than previous generations of young adults to be married, so that should give them more flexibility than earlier generations. 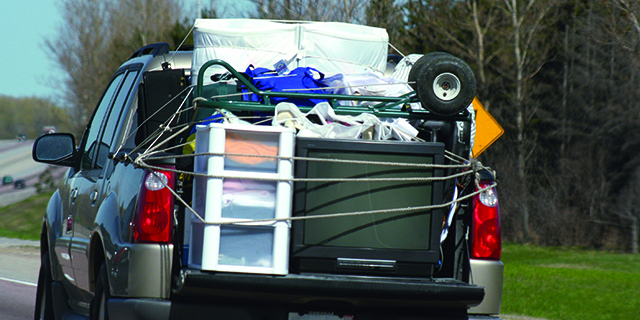 Married young adults are less likely to move than unmarried ones, in part because a married couple’s move may entail two people lining up new employment. Only 42% of Millennial 25- to 35-year-olds were married and living with their spouse in 2016. By comparison, 82% of Silent 25- to 35-year-olds were married and living with their spouse in 1963. A house. Today’s Millennials are less likely to be tied down by owning a house. It is presumably less disruptive and potentially less costly to move from a rental unit than it is to sell a house, so one would expect renters to be more mobile than homeowners. Older generations appear to be significantly more likely to have been tied down with a house when they were young adults than Millennials are today. 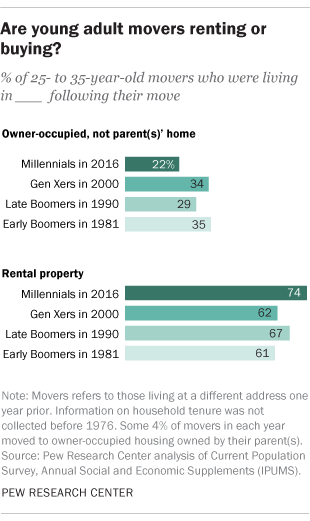 For example, 56% of early Baby Boomer 25- to 35-year-olds lived in owner-occupied housing (not owned by their parents) in 1981, whereas only 37% of Millennials lived in such housing in 2016. A child. Young adults also are more likely to migrate if there are no children present in the household. In 2016, a majority (56%) of Millennial 25- to 35-year-olds were childless (in terms of not having a child of their own living with them). Fewer than half of Gen Xers and Boomers were childless at a similar stage of life. So, if Millennials are less hampered by spouses, houses and kids, why are they moving less than previous generations did at their age? Labor market opportunities may be a factor. Millennials were hit hard by the Great Recession in terms of job-holding and wages. For many young adults who moved in the past year, job opportunities were a prime motivation for moving, and the modest jobs recovery may not be providing the impetus Millennials need. When they do move, Millennials’ motivations for moving are significantly different from those of earlier generations of young movers. 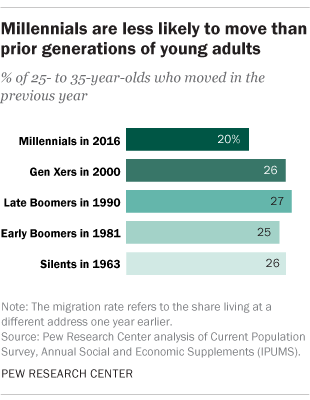 One incentive for moving is to buy a home, but Census Bureau migration data suggest Millennial movers are doing so at significantly lower rates than earlier generations. In 2016, homeownership among younger households was at its lowest level in at least 40 years. On the one hand, the different family demographics of Millennials – such as not having children – may undercut their desire to own a home. But financial considerations may play a role as well. Compared with Gen X young adults around 2000, lending standards are much tighter, making it more difficult for Millennial 25- to 35-year-olds to get a mortgage. Related to this, student debt may be deterring young adults from home ownership. According to the Census Bureau survey, in 2000 14% of Gen X movers said that their primary reason for moving was that they wanted to own a home, not rent. Just 6% of Millennial movers in 2016 were so motivated. Among Millennials who moved in 2016, 22% owned their own home after their move. In contrast, earlier generations of young movers were more likely to move into homes that they owned. For example, 35% of early Boomer 25- to 35-year-olds who moved in the year prior to 1981 lived in an owner-occupied home. So, whether by choice or by circumstance, Millennial migrants appear to be significantly less likely to buy a home than earlier generations of 25- to 35-year-old movers. Richard Fry is a senior researcher focusing on economics and education at Pew Research Center.